These beautiful micro-macrame earrings were hand knotted with a natural colored nylon cord. A larger glass bead has been used as the focal point of this set with two sizes of Picasso style Czech glass seed beads to compliment the color scheme. These are surprisingly lightweight to wear and have nickel free antique copper plated earring wires. Micro-Macrame Dangle Earrings. Modern Macrame. Knotted Macrame Earrings. Boutique Fashion. Knotted Beaded Earrings. Pink Purple Earrings. Micro-Macrame Dangle Earrings. Modern Macrame. 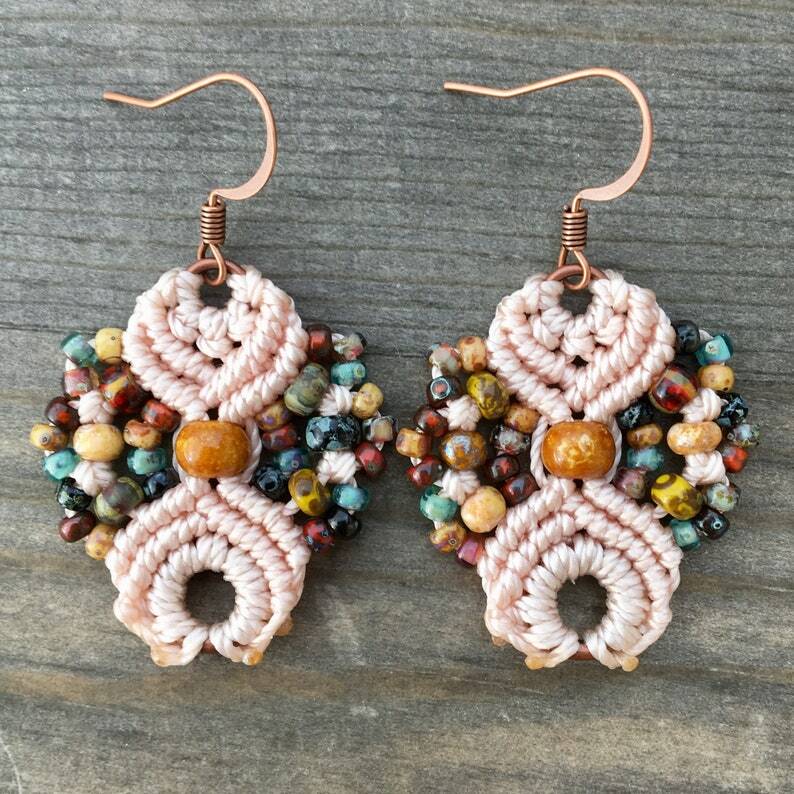 Knotted Macrame Earrings. Boutique Fashion. Knotted Beaded Earrings. Blue Mixed Earrings. Micro-Macrame Dangle Earrings. Modern Macrame. Knotted Macrame Earrings. Boutique Fashion. Knotted Beaded Earrings. Green Mixed Earrings. Micro-Macrame Dangle Earrings. Modern Macrame. Knotted Macrame Earrings. Boutique Fashion. Knotted Beaded Earrings. Pink Mixed Earrings. Micro-Macrame Dangle Earrings. Modern Macrame. Knotted Macrame Earrings. Boutique Fashion. Knotted Beaded Earrings. Teal Mixed Earrings.